If you’ve had your fill of dragon and dinosaur murder in Monster Hunter: World, you might want to try your hand at taking on the galaxy’s most fearsome monster: the xenomorph. 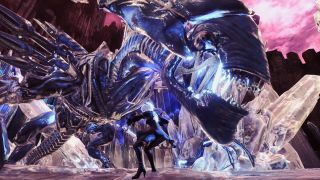 This Aliens mod replaces Xeno'jiiva with a xenomorph queen, though she thankfully doesn’t lay any eggs. Modder UberGrainey used this model to replace the dragon, though they made some tweaks, like removing the chest arms to make the monster’s weak point clearer. It looks appropriately horrifying, though not quite as horrifying as that Thomas the Tank Engine mod. I bought a bunch of Aliens comics recently, and I've been rapidly devouring them, but I’m not sure if that makes me more or less keen on a mod that lets me fight one of them. The main takeaway from pretty much every piece of Aliens media is: stay away from xenomorphs. I’m still recovering from Alien: Isolation. Monster Hunter: World has had its fair share of official crossovers, too, including Assassin’s Creed and the upcoming Witcher crossover. Could Geralt take down a xenomorph? We should find out in the name of science.